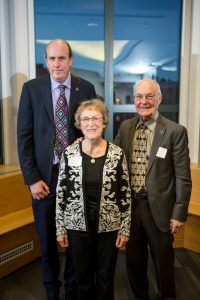 It is through this penchant for innovation that Smith, a professor in the UW Department of Electrical Engineering and Paul G. Allen School of Computer Science & Engineering, was named the Milton and Delia Zeutschel Professor for Entrepreneurial Excellence. 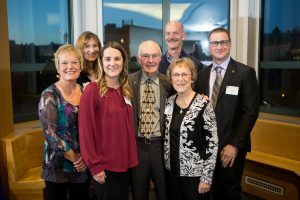 The new professorship was established through a generous gift from UW EE alum Milton “Milt” Zeutschel (BSEE ’60) and UW College of Education alum Delia Zeutschel (BA ’58) to support the department’s efforts in recruiting and retaining entrepreneurially-driven faculty, who will help build and sustain an engineering entrepreneurial ecosystem at the UW. Throughout his career, Smith gained an affinity for the development of next generation technologies. His research focuses on inventing new sensor systems, devising new ways to power them and developing algorithms for using them. His research spans multiple applications, including implanted medical devices, robotics and ubiquitous computing. Smith’s lab – the Sensor Systems Laboratory – recently released new backscatter research that has shattered a long-held distance barrier for low-powered devices. By allowing these devices to transmit data over long distances, researchers can enable a vast array of interconnected devices with almost no power. Concurrent with this research, Smith and his team launched the first battery-free phone. Although Smith has achieved a lot, the new professorship is a special milestone both professionally and personally. For him, it is representative of his research direction and of his student mentorship. From a young age, Mr. Zeutschel recognized the importance of entrepreneurship and innovation while growing up on the prairie in North Dakota. He was the first member of his family to graduate from high school. He continued to push forward, being the first of his family to attend college. His UW EE education provided him with the technical skills to become an entrepreneur. The apt combination of education and personal discipline propelled Mr. Zeutschel to start from the ground up. Over his career, he founded five companies, three of which – Zetec, Data I/O Corp. and Zetron, Inc. – were met with resounding success. For Mr. Zeutschel, he is pleased that his success can give back to future generations of entrepreneurs. A UW education is very important to both Delia and Milt Zeutschel. For Mr. Zeutschel, his time at UW EE shaped his career and offered him the skills to venture into uncharted territory as an entrepreneur. For Mrs. Zeutschel, her time studying at the UW College of Education laid the foundation for her work as a teacher. Through this scholastic lens, the Zeutschels directed a significant portion of the endowment to support the Electrical Engineering Entrepreneurial Capstone Program (ENGINE), which enables current and future UW EE students to engage in real-world industry partnerships and gives local companies an opportunity to benefit from the vibrant innovation culture at UW EE. Within the last three years since its inception, ENGINE has seen significant growth. This year, over 50 companies signed up to mentor students, nearly 3 times the number since the 2016-2017 academic year. Within that time, there has been a 100 percent increase in the number of projects available. Over 40 percent of the graduating UW EE class participates in ENGINE. At the end of his speech, Milt looked out into the crowd. “If there are any students here tonight, I simply want to say ‘go for it.’” Although Mr. Zeutschel didn’t clarify exactly what the “it” signified, the feeling of it was palpable – a sense of limitless possibility.